Cards, Cats, & Collections, Too! Sharing my love of card-making, cats, and collecting miniatures! We're celebrating birthdays at Mo's Challenge this week! I've used "Alissa with Roses" on this card. All Mo's images are adorable, but I think the face on this little lady is just lovely! She's an absolute joy to color, too! I really love the way this card turned out. The 'frame' behind the image panel is actually two whole die cuts with parts of a third to fill in the gaps on either side. Inside: "To celebrate you! Happy Birthday!" Here's another birthday card. This one would be perfect for a young boy. Isn't this little rascal cute?! Who's going to be the next one soaked? 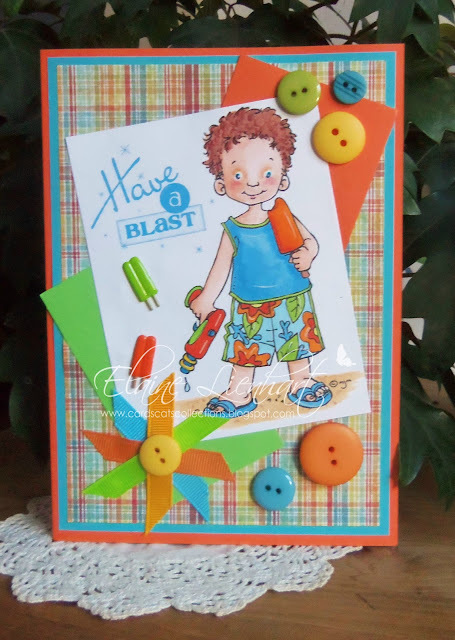 Birthday cards are such fun to make, so make something wonderful and join us in the fun at Mo's Challenge! 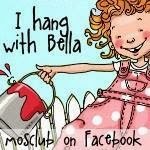 You just might be one of the lucky ones to win a $5.00 gift certificate to her store! Two gorgeous cards Elaine. Love the image on the first card and a beautiful design. The second card is very bright and cheerful. Your flower bouquets match so perfectly on your first card Elaine. So pretty. The buttons on the second card are so cute. I love to use them for embellies. Hugs! A pair of adorable creations Elaine! The first one is so delicate and romantic, the sentiment is just perfect! Love the bright colours and the lovely embellishments of the masculine one! Elaine, love your Beautiful Day card, you always seem to pull off the lavendar cards, I just don't do lavendar LOL. Your coloring and embellishments are always so perfect. Wonderful card!!! 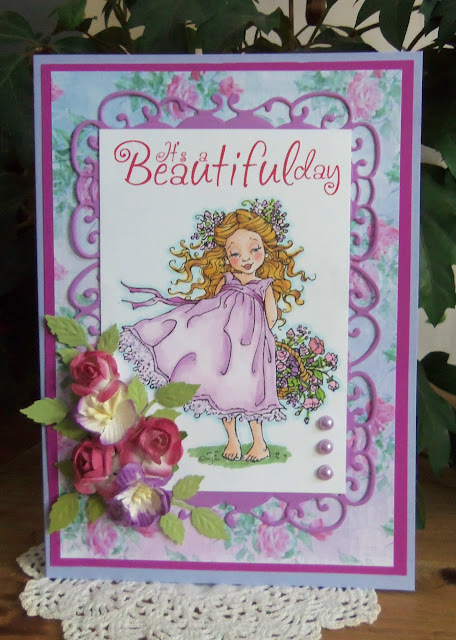 Your sentiment says "beautiful day" and I say beautiful card(s)! So gorgeous, Elaine! Love the dies behind the image on the first card and those wonderful flowers matching the paper and image. I just love your birthday card and the sentiment is so perfect. Love how you used the Marianne Dies. Love there dies. I use SU! card stock almost exclusively. They have changed and added so many colors over the years, and I have so many of their colors that are no longer available, that it doesn't make sense for me to attempt to name them any longer. If you really want to know what a certain color is, just ask, and I'll try to figure out which one it is. Also, all the white card stock I use to print my images on is Neenah Smooth White. I love using it with Copics! It does bleed through, but, since I mount all my card fronts, that's not a problem. I use Paper Trey Ink's white card stock for all of my white card bases. It's very sturdy. I design for Rick St Dennis!